What to have on hand: You will need a nail trimmer designed for pets (DO NOT USE CLIPPERS DESIGNED FOR PEOPLE), and a nail file to trim the nails. You should also have a “blood-stop” or styptic product handy incase you trim a nail too short. You may also need a warm, wet cloth and a small scissors to clean the feet. Inspect the nails and feet: Before clipping nails, make sure the entire foot is healthy and clean. Inspect the area between the toes, pads and at the base of the nails for dirt. debris and matted hair. Matting between the toes and padding can pull on the skin and cause pain while you work with the feet. Removing any matting will add comfort to the foot. Remove any matting between the toes and pads with a small scissors, being very careful not to nick the skin or pads. Clean any dirt from inbetween the toes and pads and at the base of the nail with a warm, wet cloth or cotton. Where to cut: Within the center of each toenail is the blood and nerve supply for the nail called the “quick.” Cutting into this area will cause bleeding and pain. In white nails you can see the vein or “quick.” It looks like a pinkish area in the middle of the nail. You want to cut outside this area leaving a little room at the end of the nail. In dark nails, the quick is not visible, making them more difficult to trim without cutting into the quick. Cut dark nails in several small cuts to reduce the chance of cutting into the quick. Clipping your dog’s nails: Begin by spreading each of his toes. Using a sharp guillotine-type nail clipper, hold the clipper with the face plate and screw towar the dog’s toe as in the figure here. Cut off the tip of each nail on a 45-degree angle, just before the point where it begins to curve. If you cannot visualize the quick, trim very thin slices off the end of the nail until you see a black dot appear towards the center when you look at it head on. This is the start of the quick that you want to avoid. 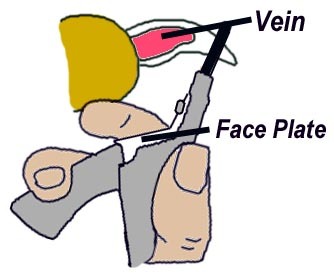 Bleeding: If the tip of the nail begins to bleed, apply pressure for a few seconds using styptic powder. Filing: Once the nails have been cut, you can smooth rough edges with a file, emery board or grinder. Do not file any nails that had bled. Make sure to get every nail. Many dogs have an extra nail on the inside of the foot near the ankle called a dew claw. It is extremely important to trim the dew claw because it does not contact the floor and will not wear down. A few breeds also have a dew claw on the hind feet and some breeds such as the Great Pyrenees have 2 dewclaws on each hind foot. Don’t forget to praise your dog and reward with a wonderful treat.